For my birthday, my sister Suzie bought me Crust and Crumb by Peter Reinhart, and I was excited to get started on the delicious sounding recipes. However, the book takes bread making very seriously and has some required reading before starting baking. So I got going on my homework, diligently reading the introduction and first two chapters on ingredients, tools, baking methods and preparation. I learned about how to check for proper gluten development when kneading, how to determine the right time to put the bread in the oven, how to generate the right amount of steam in a home oven for proper crust development and how to form different types of loaves. Then I started looking at the recipes to determine where I should start. Since most of the recipes require preferments and multi-day rising and rest times, this involved a bit more planning than I usually put into bread. 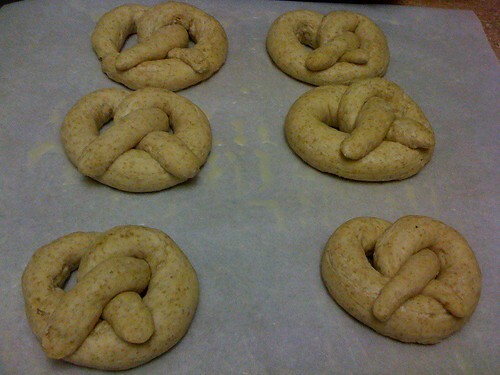 I decided to start with two types of preferments — a biga and a poolish, and then see what I could do with those. 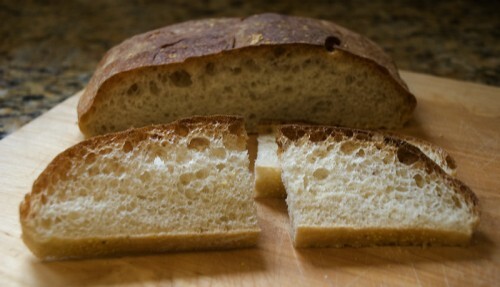 With the biga, after an overnight refrigeration, I made a simple rustic bread. This bread rose like no other I’d ever seen — an hour after mixing the biga and the rest of the ingredients, it was spilling over the edges of the mixing bowl, so I decided not to let it go for its 4-hour rise time and separated the bread into 3 pieces after less than 2 hours. The 3 pieces again doubled in size in the next hour or so, and then after I gently shaped the oblong loaves, those rose even more before I put them in the oven. 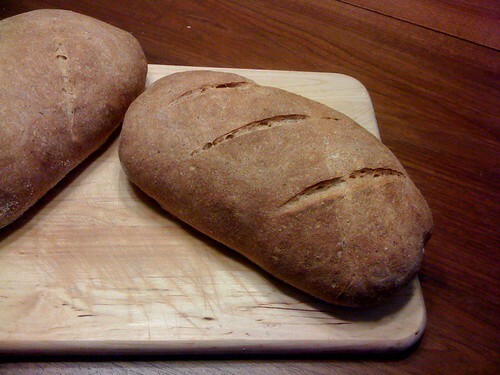 Though the baking turned out a little uneven since I used two racks, all the loaves were quite good, with the two loaves on the upper rack having a much better crust than the considerably paler and softer loaf that was on the bottom rack for most of the baking time. I thought the air holes inside would be a bit bigger, but there were at least quite a few. I might have needed to be more gentle while forming the loaves. Overall, though, quite a success. With the poolish preferment I decided to try a sweet rustic loaf. Peter wrote about having this loaf as a healthier replacement to croissants and other breakfast breads, so how could I really resist. I mixed together the dough, which was very soft, let it rise, and then cut it into wedges. The wedges were so soft that they pretty much became mostly round puddles of dough, so I was worried something went wrong. After a night (or three — I baked 2 batches) in the fridge, my eight little loaves looked even more pathetic, sitting slack on their parchment paper, but I decided to push forward anyway. And am I glad I did! 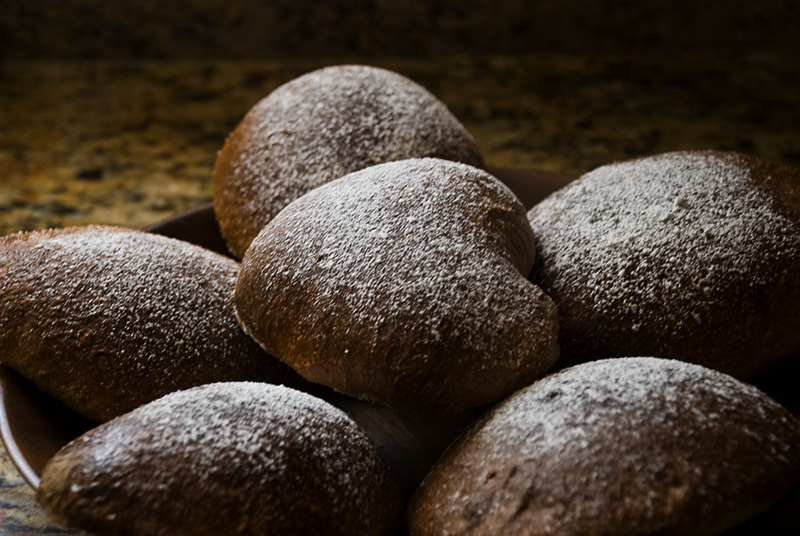 My rustic sweet breads puffed up immensely in the oven, forming beautiful, browned, crispy loaves with an incredibly open and shiny crumb. The bit of powdered sugar dusted on after baking also added an incredible last bit of sweetness to this only slightly sweetened loaf. The breads looked incredible and tasted at least as good. 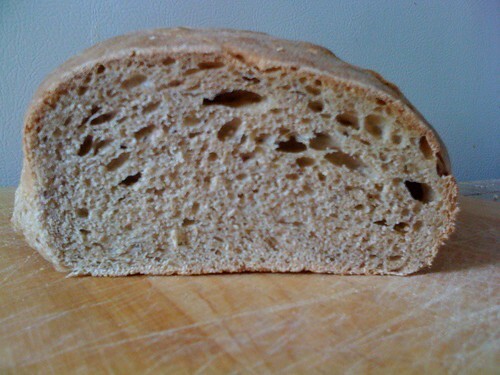 I didn’t take a kitchen shot of the beautiful crumb, so here’s one I took at the party I brought them to with my iPhone. I also tried one of the pizza dough recipes from the book. Since the recipe for the poolish preferment ends up making a ton of the gooey mixture, I wanted to see how much I could make in the few days that it would be good. The pizzas turned out very well, with a chewy, New York-style crust that browned nicely, stretched extremely thin when shaping, and supported the pizzas well. Unfortunatley, I didn’t take any photos — we were so hungry we gobbled the pizza right up! And Evan and I both agreed that while it was a good pizza, it just wasn’t as light and fluffy and flavorful as the pizza dough recipe I’ve been using from The New Vegetarian Epicure. 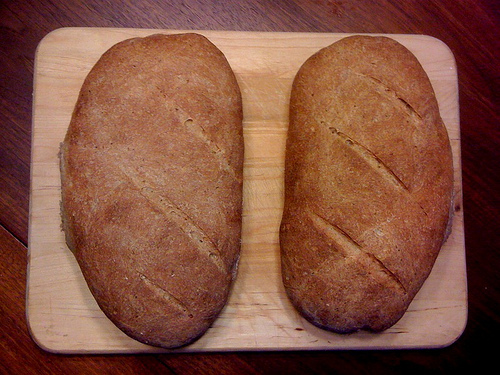 In all, though, an awesomely successful week in bread making for me. 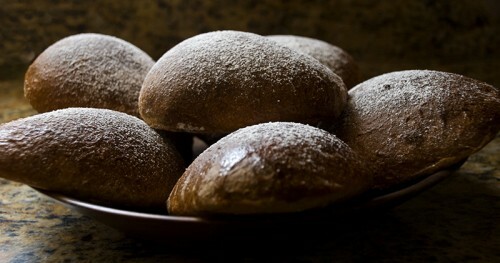 I learned a lot about making bread in the process, too, and even the Montreal Bagels I made last weekend, which I’ve been making for nearly a year now, were better because of my new knowledge. Thanks for the gift, Suzie! Last night Evan and I had a few friends over for dinner and I made pizzas — three of them. I’ve been working on perfecting my pizza recipes, and we have some clear favorites so far. 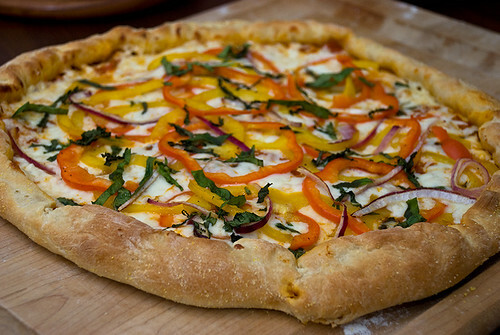 This has been one of our favorite pizzas pretty much since the first time I made pizza from scratch. We love it so much we make it every single time we have pizza and we haven’t gotten bored of it yet. The secret is that the peppers and onions are marinated in a little bit of red wine vinegar, garlic and olive oil. I make a fresh pizza sauce, use mozzarella cheese and finish it off with some fresh basil. It’s a modification from the Chez Panisse Vegetables cookbook. Simple and delicious! I made this pizza for the first time yesterday, and I was thrilled with how it turned out. 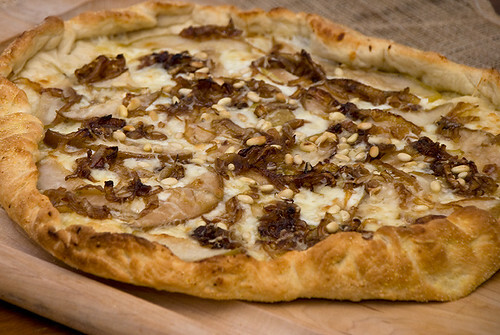 It’s a pear, caramelized onion and pine nut pizza with provolone and parmesan cheese. I cooked the onions for close to an hour and added some balsamic vinegar at the end, and then sauteed the pears briefly in that same pan and with a little bit of rosemary. I also brushed the crust with garlic and olive oil before I put the cheese on. I’ve made variations on this pizza a couple of times. 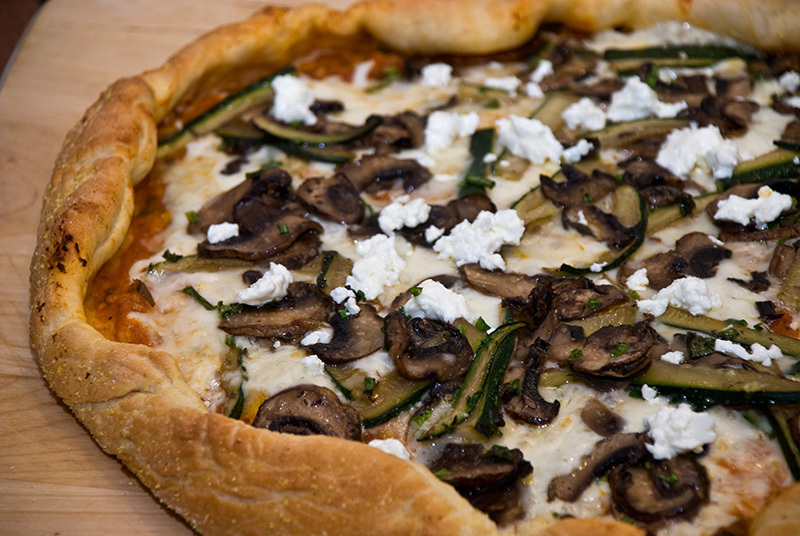 It has mushrooms and zucchini sauteed in olive oil, garlic and oregano, mozzarella and fontina cheese, and a little goat cheese added after baking. It also has the same tomato sauce I made for the pepper and onion pizza. Since I first started making pizza, I’ve also found a new dough recipe that I like a lot. It’s from The New Vegetarian Epicure and I’ve made it three times now — it always turns out light and fluffy, and I’ve started folding over the edges to make a nice rim around the pizza. I also use the sauce recipe from The Vegetarian Epicure, which has lots of fresh tomatoes and herbs cooked down into a very flavorful sauce. 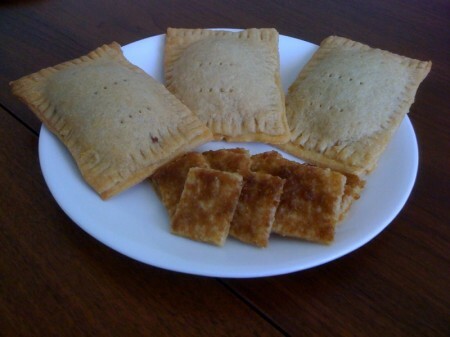 Yesterday, Evan saw a post on Lifehacker about making your own pop tarts. Now, it’s not that we’re even pop tart or breakfast pastry fans — neither of us grew up eating them, and we don’t really eat anything of the sort now, but those flat little fruit-filled pastries do have some nostalgic appeal. I remember eating them on camping trips with my summer camp as a kid. I took a look at the recipe and it didn’t seem too difficult — just some pastry dough and jam thickened up with a little corn starch for the filling. And as I’ve been a bit of an early riser lately, I decided to play around with making these this morning. The dough was a little difficult to work with — it has a lot of butter in it, and though it wasn’t that warm in my kitchen, then dough would warm up quickly and start sticking to the rolling pin. I ended up sandwiching the dough between parchment paper on the bottom and plastic wrap on the top to roll it out to the right size and thickness. I also made a slight modification to the recipe and used a cup of all purpose flour and a cup of white whole wheat flour to try to make it a little healthier. For the filling I used low-sugar raspberry preserves, and since I didn’t have corn starch, I used some corn flour, which did the trick just fine. Ultimatley, my homemade pop tarts were delicious — the pastry was rich and soft though still kept a good structure to support the filling. The filling was sweet and its flavors mixed well with the crust, and the pop tart tasted less like the flat brand-name treat and more like a delicious cookie. Also, since the pop tarts need to be trimmed to an exact size you end up with some extra dough, and the recipe suggests to just turn those into cinnamon sugar cookies, which turned out just perfectly. I don’t want to think about quite how much butter went into these pop tarts, but they are an impressive treat to make and thankfully taste like they’re in a totally different food category from the boxed variety. 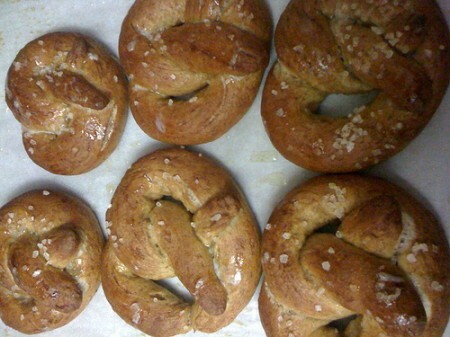 You can check out the recipe at Smitten Kitchen or King Arthur Flour. Last week I got some dates in my LOVE Delivery box. I don’t really like dates plain very much, so I wasn’t sure what I was going to do with them. 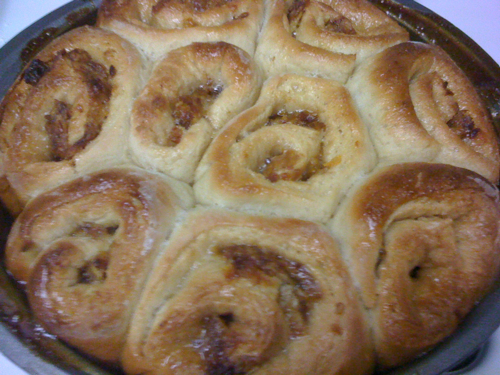 Then, over the weekend, I started thumbing through the bread recipes in How to Cook Everything and came across a recipe for orange date rolls — a variation on sweet rolls and cinnamon rolls. 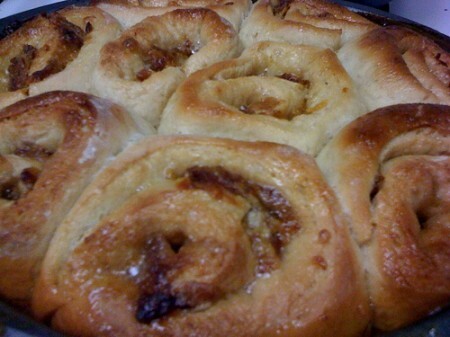 I’ve never made them from scratch before, but the recipe didn’t seem too difficult. The dough came together easily — a mix of flour, sugar, salt, butter, milk and yeast. I let it rise for about 2 hours before rolling it out into a square. I then brushed on butter, and covered it with a half a cup of brown sugar, 6 or 6 chopped up dates and the the chopped up zest of a large orange. I rolled up the rectangle, then cut it into slices about an inch and a half wide. I was worried that they were a bit small and loose, and the recipe said to put the rolls in individual muffin tins — and I don’t have a muffin tin — so I just put them in a cake pan and hoped they would rise. 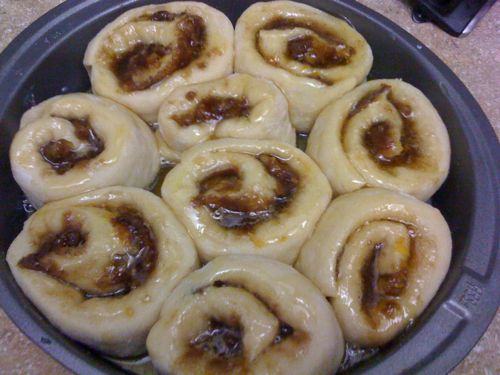 Thankfully, after an hour they did, and I made a glaze with orange juice and sugar to pour over the rolls before I put them in the oven. 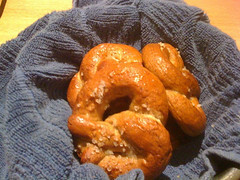 After baking for about 30 minutes at 400 degrees, they smelled incredible and puffed up even more. They were slightly shiny from the glaze, and when I started pulling them apart, they came out easily and were soft and fluffy and sweet, but not overly so. The finished product -- they turned out perfectly! 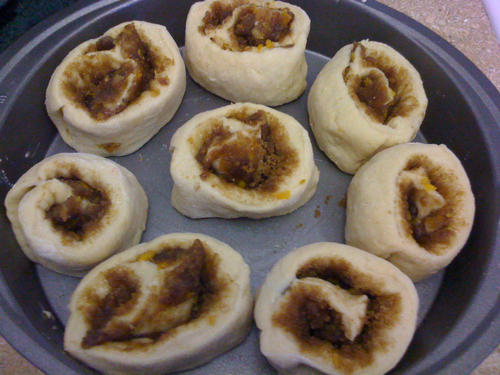 I’m not normally a big fan of cinnamon rolls and the only time I ever tried Pillsbury orange rolls I didn’t like them very much, but these were incredible. I guess I’d just never had something like this fresh out of the oven. The orange and date flavors weren’t overpowering, and they blended together well. They also looked quite good. They weren’t the same at all after they had cooled. Though I ate one for breakfast the next morning, it wasn’t anywhere near as soft or tasty as it was straight from the oven. I don’t typically make a lot of sweets, but there were totally worth it — and even though they take 3 to 4 hours to make, I would definitely try to make them for a breakfast/brunch (though I think I’d let the dough do its first rise in the fridge overnight so it would take a bit less time). 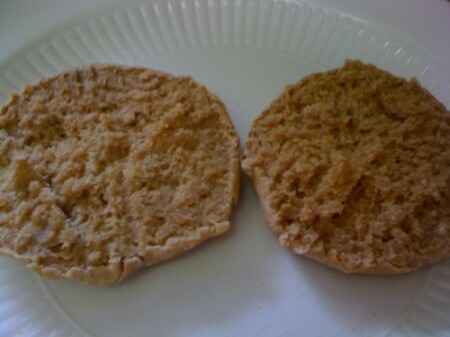 The first two times I made english muffins, I thought they were delicious but I missed the nooks and crannies that you get with fork-split muffins that toast up nice and crispy and catch lots of butter and jam. 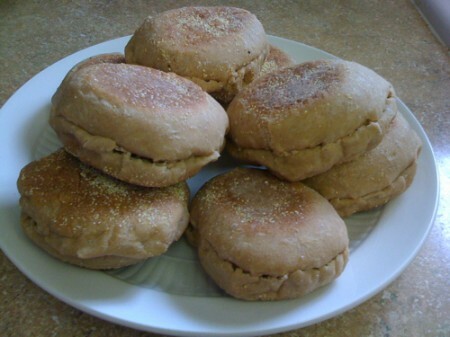 I also missed the little crunch of cornmeal that most store-bought english muffins had, so I decided to modify the recipe a bit to get what I wanted. So instead of dusting with flour before the muffins rise between two baking sheets, I dusted with corn meal. That was easy enough. And for the nooks and cranies, I decided to try fork splitting. After much Googling, it seemed that the way to do it was to just poke the english muffin all around with a fork as soon as it came off the stove. I tested it out — it wasn’t too hard since the muffins don’t get too hot and can be handled by hand right off the stove. It worked perfectly. They’re now easy to separate by hand, and they have a great texture from pulling them apart. They didn’t look quite as pretty with the sides mangled from the fork, but I could have probably been gentler. I just wasn’t sure what sort of pressure I needed to make sure they split easily. So that’s it! The secret of how to make nooks and crannies revealed!